“I have a feeling that tonight you’re going to see one of the Riviera’s most fascinating sights.” Frances Stevens flirted with John Robie. This Alfred Hitchcock film is another example of superb film making. You don’t see films of suspense like this anymore. 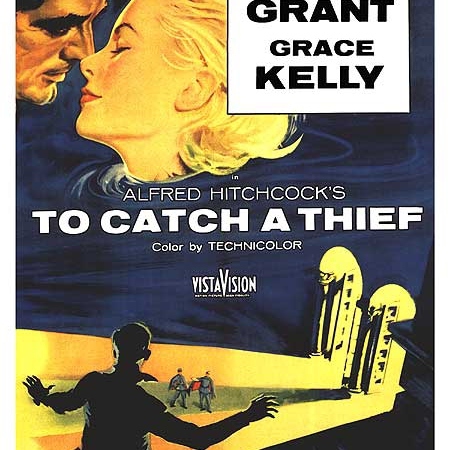 Such a movie with Cary Grant and Grace Kelly is really something to see. Here is the plot of the movie…Notorious cat burglar John Robie (Cary Grant) has long since retired to tend vineyards on the French Riviera. When a series of robberies is committed in his style, John must clear his name. Armed with a list of people who own the most expensive jewels currently in the area, John begins following the first owner, young Francie (Grace Kelly). When her jewels are stolen, Francie suspects John, destroying their tentative romance. John goes on the lam to catch the thief and clear his own name. The film was directed by Alfred Hitchcock and the score was done by Lyn Murray. I really like this movie, I’m a fan of Cary Grant though as well. There are multiple Hitchcock films of which I have not seen yet. I’m hoping to broaden my scope and see more of them as time goes by. The soundtrack is found on Amazon. The main theme is also found on ITunes. Well that’s all for today, Look forward to Thursday when I bring you Mr. Holmes. Next Next post: Mr. Holmes, I Say!